He almost missed the party though, for they told him to be present ‘around 9:30’ which usually is the Italian way of saying ‘don’t get up early – be here around 10’. Not today: upon reaching the fork with the Stelvio (from Valdidentro, where he mounted his bike in front of the hotel), the masses where coming towards him. He first thought that these were only the pros, but after a few minutes, he realized that everyone must have started. So, he wrestled his way down the last 2 curves and approximately 2 kilometers, to get to the official starting line. After all, he had a chip, so the climb would be timed. By the time he reached the start, they were rolling up the mat that records the departure (time) and he was afraid it might have been disconnected already. However, he did get an official time for his Mapei Day climb of the Stelvio: here, nr. 234, which is off by about 7 minutes from the Garmin recording here. Anyway, he was the last one to start for sure, so it was clear from the beginning that a time within 1:30 would be near impossible. Cyclists need an non-proportional part of the road, if there’s no traffic and they can ride ‘wide’. You have to swirl around them and by doing so, you make at least 10% more kilometers. Oh well, the ride up itself was still beautiful, albeit well known by now. The advantage is that you know when the ugly (i.e. steep) stretches are coming and when you can either recuperate or accelerate. The only problem was that it was even colder this time; he was dressed for that (going up), but even with an extra wind blocker the descent was killing. 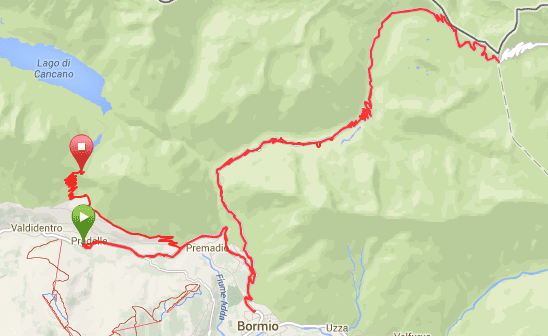 So, he decided to go back to the hotel first to take a hot shower, instead of going up the Torri di Fraele immediately. Of course, the rain was getting stronger every 15 minutes, so he did take some time to decide if he was going out again. But he did: this climb that he found yesterday looked so nice that he just had to try it. It is a well hidden treasure in this area, although the locals know it all too well of course. Yesterday, there were a lot of cyclists going up (and down), but today C. was the only one. It’s not very long and the altimeter gain is (only) around 600 meters, but the hairpins are great and the view is spectacular. Even with the rain pouring down, it was a very nice experience, which he wouldn’t have wanted to miss: a hidden gem found for his birthday. The stats of this final ride: 66.7 km / 2,163 altimeters – tomorrow they’re heading back Brunssum.